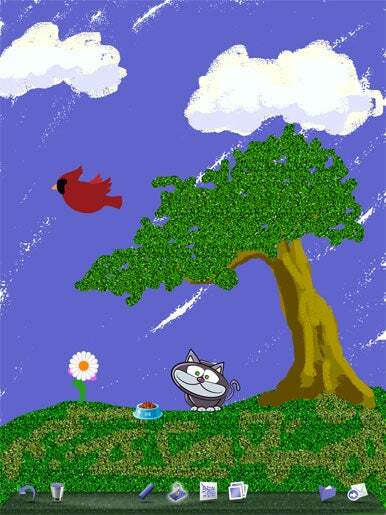 Doodle Buddy, developed by Pinger, is a simple drawing app available in iPhone and iPad versions. While not as full featured as some other apps like Sketchbook Pro or the iPhone and iPad editions of Brushes, Doodle Buddy is extremely easy to use, great for kids, and, best of all, free. The iPhone and iPad versions of Doodle Buddy are a little different so let’s take a look at the iPad app first. You have five different brushes for creating your doodles—a round brush, chalk, glitter, smudge, and eraser. Each of these brushes can be resized to your liking, and you can choose virtually any color to draw with, thanks to a rainbow color selector. The iPad version of the app supports multi-touch painting so you can paint with up to four fingers at a time. Drawn Out: Offering a selection of backgrounds, a multitude of stamps, different brushes, and multi-touch painting support, the iPad version of Doodle Buddy is a fun drawing tool, particularly for kids. The inclusion of a smudge tool was, for me, a bit of a pleasant surprise. The effect is much like rubbing your finger over chalk causing it to smear. You also have plenty of stamps to use in your doodle. Stamps range from smileys, hearts and animals to a guitar, skull and disco ball. The stamps can be large or small and each one has an amusing sound effect whenever you use it. Each brush also has its own sound effect as you paint, but they just get really annoying after a while. There’s no option to turn the sound effects off, so I found myself turning my iPad’s volume all the way down. 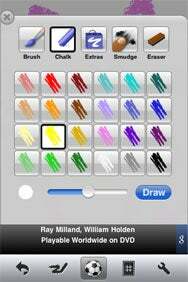 You can choose to paint over one of the preloaded templates like tic tac toe or hangman as well as a few photographs. You can also use one of your own images from your device’s photo library. However, when I tried to do that on the iPad, my photo usually loaded upside down. The app offers an undo button for any mistakes you might make as well as a folder icon you tap to save your drawing to your device’s photo library. Once you’ve finished drawing, you can share your creation via e-mail. You can clear the entire drawing by tapping the trash can icon or by shaking the device. Unfortunately, there’s no way to undo this action, so if you accidentally erase your whole drawing you’re just out of luck. I had this happen once when I bumped the iPad after drawing for ten minutes. Drawn to You: On the iPhone, Doodle Buddy is missing the glitter brush and rainbow color picker found in the iPad version. But it’s still fun to use, and it has a few features Doodle Buddy on the iPad lacks. On the other hand, the iPhone contains some features you won’t find on the iPad. For instance, you can paint with a friend who is on the same Wi-Fi network. Of course, you both have to have iPhones with the Doodle Buddy app installed and running. Once connected, whatever either person paints shows up on both devices’ screens. Collaborating with a friend was easy to set up and pretty fun, even if there’s a slight delay between the two screens. Instead of the e-mail sharing option the iPad has, the iPhone version can only share paintings via Facebook. Thankfully, there’s also the option to turn the sound effects off. Regardless of which device you use, Doodle Buddy is a fun way to doodle away without all the trappings and higher learning curves of more sophisticated painting applications in the App Store. It’s definitely one of the best free drawing apps out there.